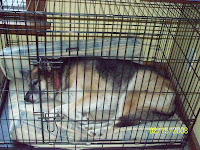 Having a crate handy no matter the age of your dog is wonderful if you have children in the home. This allows the dog a "chill out" zone and place where they can do nothing at all and be left alone. For some dogs who feel like they need to follow you all over the house, this is a relief. If you are expecting and have not used a crate with your dog in a long time then you may consider reintroducing it. There will be times that the crate will come in handy to secure your dog and you and your dog will be grateful you took this extra step. Here are a couple of tips for reintroducing the crate if you have not had it out and your dog has not been in it for awhile. 3. Close the crate and allow your dog to sniff and beg to get in. 4. After he asks to get in...open the crate and let him in to clean up the hot dog and leave the door open to come in and out. When he is in the crate Say something that indicats he is in the crate...."good crate" Repeat this over a couple of days...several times a day. 5. Then close door for short periods of time leaving your dog with a durable food dispensing toy such as a type toy. Begin with short periods of time and let your dog out while he is still calm. Gradually extend the amount of time. This is just a basic example of one way to begin. There are many ways and there are differerent adjustments for different dogs. IF your dog is stressed or experiences anxiety. Please contact one of our presenters for some guidance to support you and your dog in an alternative method or managment technique.